Restriction. 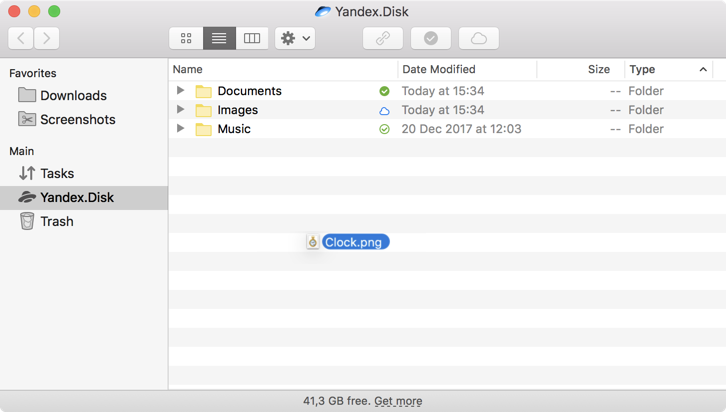 Yandex.Disk can only be installed on computers running OS X version 10.11 or higher (El Capitan, Sierra, High Sierra). Download the application on the Yandex.Disk page. 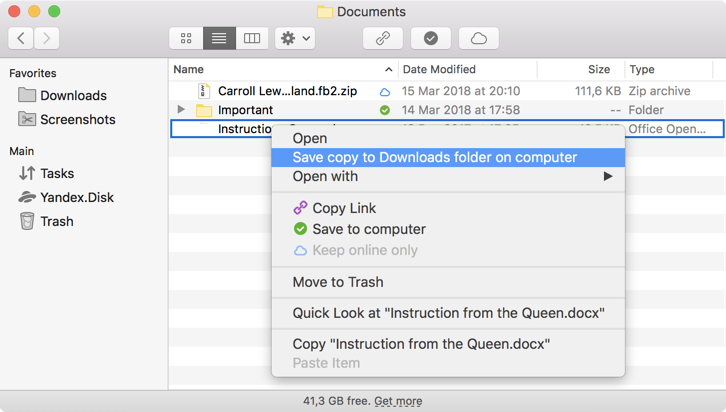 Once the download starts, the page will display instructions on how to launch the file (the file will launch automatically if you're using Safari). 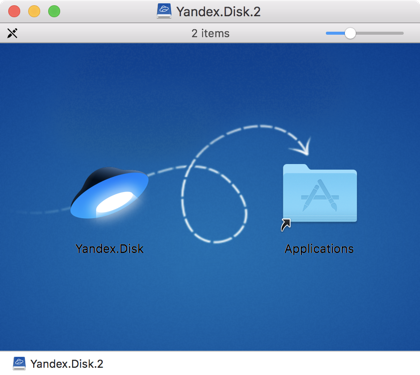 If you previously had the classic application or Yandex.Disk 2.0 installed, you can remove the old application after installing the new one. You will be asked to enter your Yandex username and password the first time you launch the application. Until you log in, will display in the menu bar. If you didn't log in right away after installing it, double-click on the app icon in the menu bar. Attention. If you use two-factor authentication, you will need a one-time password, which is generated by the “Yandex.Key” app, to log in to the Yandex.Disk application. 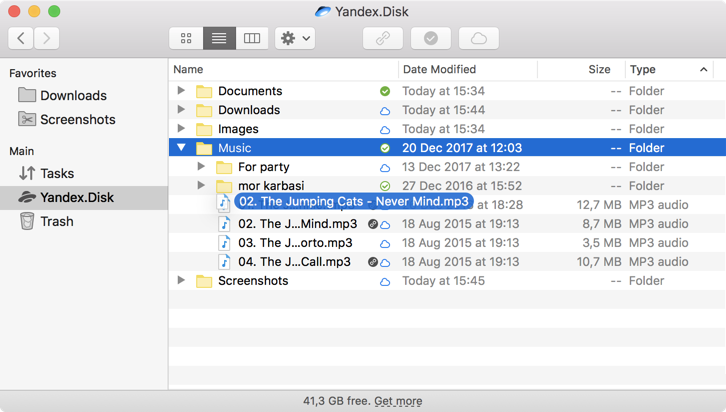 The Yandex.Disk 3.0 program lets you synchronize just the files of your choice on your Disk and save disk space on the computer. For example, if you often work with the “Documents” folder, turn on synchronization for it so this folder will be stored on the computer. The rest of the folders are stored only in the cloud, but they are available also in the program. The syncing status is displayed to the right of the file or folder name. — The file or folder is stored on the computer. — The folder content is partly stored on the computer. — The file or folder is stored only in the cloud. — The syncing status is unknown. To turn on syncing for files or folders, choose them from the list and click the button above the file list or click Save to computer from the context menu. When the file is synced with the computer, the icon to the right of it changes from to . You can then view it in Finder: click Show in Finder in the file's context menu. To free up space on the computer, turn off syncing for a file or folder. It is removed from the computer but is still available on the Yandex.Disk page. To do this, choose it in the list and click the button above the file list or choose Keep online only from the context menu. When a file or folder is removed from the computer, the icon to the right of it changes from to . Open the Disk folder in Finder and drag or copy the files to it. This way files are saved both on the computer in the Yandex.Disk folder and in the Yandex.Disk cloud. Copy or drag the files to the application window. This way files are saved directly to the Yandex.Disk cloud and aren't stored in the Yandex.Disk folder on the computer. Note. To save files and folders uploaded from the application both in the cloud and on the computer, right-click Yandex.Disk in the left menu and turn off the Save new files and folders online only option. Turn on the Show drop zone option. You can track the file upload in the Tasks section (in the left menu of the program). Note. If your internet connection is disrupted, your upload will be paused. When the connection is restored, the upload will resume. After you upload your files, they will be on the server. You can open your Disk page to make sure that all the files have been uploaded successfully. To open a file for viewing or to make changes, double-click on it in the file list. The file opens in the default application for this file type. If you want to open a file in a different app, choose this app in the file's context menu. When you edit a file and save it, changes are automatically uploaded to Yandex.Disk. In the context menu of the file or folder, choose Save copy to Downloads folder on computer. Note. The downloaded file doesn't sync with the cloud. If you downloaded and edited a file and want to add it to Yandex.Disk, upload it manually. You can see the file download progress in the Tasks section (in the left menu of the program). Once the file is downloaded, you will see a pop-up notification in the upper-right corner of the screen. Click the notification to open the folder with the file. Files are downloaded to the system's “Downloads” folder. Moving files and folders works the same way as on a computer: just drag and drop them to the place you want. To move an item, drag it to a folder. If you want to move a file to a subfolder, hold your cursor over the folder to open it. Choose an item and click the button above the file list or choose Copy link from the context menu. If you click on an empty field inside the folder, then you can copy the link to that folder. Drag it to the Trash icon in the folder tree on the left. In the context menu of the file or folder, choose Move to Trash. Attention. When you delete files in the program, they are moved to the Trash and stored there for 30 days. They are then automatically removed from the server. Once removed from the server, these files cannot be restored. To delete a file from your computer but keep it on the server, set up custom syncing. To empty the Trash, right-click on the Trash icon and select Empty trash. The Yandex.Disk application doesn't feature auto-upload from devices connected to the computer. But you can turn on unlimited auto-upload in the Yandex.Disk mobile app or upload the files manually. You can create and edit screenshots with the Yandex.Disk program, then save them to your Yandex.Disk and share them. Read more in the Screenshots in Yandex.Disk for macOS article. 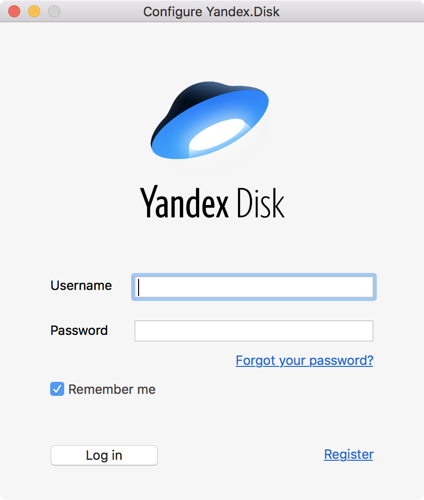 If you encounter a problem using the “Yandex.Disk” program, use the feedback form to let us know. Attach the program logs to the message.